THANK YOU TO ALL WHO PLAYED ALONG THIS MONTH!! CONGRATULATIONS ESZTER!! Please email me at nicolle@creativeembellishments.com to claim your prize!! Happy April!!! It’s that time of the month again!!! Happy Spring! I hope everyone’s year has been a good one so far. We have had quite a few challenges this year I won’t get into because is boring business related , techy and mechanical stuff. We have a few fun things going on this month. Be sure to scroll all the way to the end of this post for all the details. On to the challenge. ..Please be inspired by at least 1 element from the picture below and let us know what you were inspired by. For the TWIST : ADD a FLOWER to your project/ layout etc. >Create a NEW project layout, mini album, tag, card, canvas, etc….as of April 1st, 2017. Now onto the DT’s amazing reveal!! Hi all, Where is the time going? Spring already? Just want to share a happy warm layout with featuring my most important garden tools. Wink Wink. 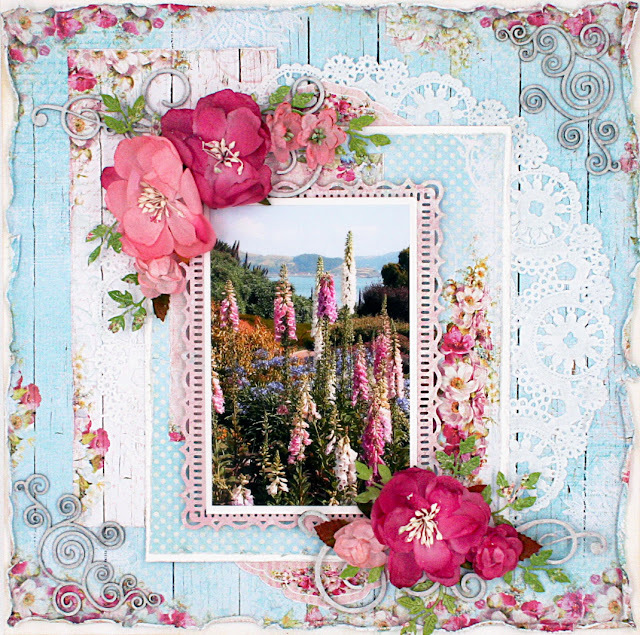 I love spring and the mood board is perfect for this layout and who doesn’t like flowers. I started out with some background work using the Distressed Chicken Wire Stamp and the Distressed Corner Stamp. I did some simple alteration on the Grass Board Chipboard and Flourish 27 with some Lindy’s Spray. And I toped it off with the Months of the Year and some more stamping with the Distress Circle Stamp. So enjoy the warming weather and all the new blooms peaking their heads out. Hello, its Marci. I was inspired by all of the colors and immediately thought of this photo of my grandson Talan, going off to school early March for WACKY WEDNESDAY dressed in most ALL of these colors. So, I continued and incorporated all of the colors into the page! I used (click & go!->) GEARS & Hashtags. I used a layer of gesso and once dry, I used Tim Holz distress paint to color those gears for a playful effect. I cut the title on the Silhouette Cameo and added the twist of flowers and used (click & go->) March & Spring FLAIR; I am having a love affair with flair buttons! LOL! If you have some time, please join us for a chance to win $50 in wonderful products! Hello! Nadine here with two tags I created. Color is always something that really inspires me so I went with a green theme to go with this month challenge photo and also added some green flowers. I used some Bird chippies and embossed them with some green, pale yellow and sand embossing powder. I also used the Flourish 23 on each tag, painted them with white gesso and sprays a little bit of green Tattered Angels Glimmer Mist on them. Hi it’s Bev…. today I was inspired by colour and the extra twist to add flowers. With that in mind I chose my papers, photos. lots of flowers and Creative Embellishments accents: Flourish Butterfly Set. Family Banners, and Sunflower Border chipboards. All the chipboards were inked for colour. I stamped using the Half Tone Circle on the background using white ink and textured using modeling paste and added a fun Season’s Change flair button. With the addition of a few other flowers from Petaloo, some stickles glitter, some gel dots, bead heart and some cardstock matting I share my family with you. One of my favourite things to scrap is my family as you see in this super fun and bright page. Hi, Maggi here and it’s all about spring for me! I’m tired of cold weather and ready to see some beautiful flowers in bloom! My inspiration simply from the word spring and the fuschia color. I used Photo or Page Corners Set 1 to accent the corners of my layout. Then I used Vintage Flourish Set 3 underneath my flowers. I love the look of chipboard peeking out from behind flowers. I guess I kept it kind of simple today, but sometimes, simple is best. Here I think you can appreciate the beauty of the flourishes and the extra style it adds to my layout. It’s April and for me in Canada that means that we are getting closer and closer to having beautiful weather. March brought lots of cold and snow to Montreal, so I pulled out a family picture of our summer Cuba vacation for this page. I felt the need to have a sunny picture for this beautiful challenge. I was inspired by the flowers but also by the watermark background of the challenge image. I used my most recent favorite stamp with teal embossing powder. I just love this Maroccan stamp. For my watercolor effect, I played with my Lindy’s sprays over a clear gessoed background. The next element that I used was this Globe Chipboard. I used the 6 inch one. Feel free to come visit my blog if you want more detailed pictures of my page. Wishing all of you a wonderful crafty day. Hi all! I am so glad it’s April and spring! Every year I dread the winter here in Wisconsin and so look forward to spring! I was inspired by the colors, flowers and the word “Spring”. I used a Grunge Square Frame that I heat embossed with silver and black. I added Seagrass, which I also heat embossed, to the lower right corner of the frame. Then I added a flair button from the March Flair Set. I used the Distressed Text Stamp on my background paper. For my title, I used Spring Love, which I added Gesso and ink to. Finally, I added 3 Bumblebees that I colored with Sharpies. I added Stickles to the wings. Check out my blog for close up photos. Hi everyone and happy March…yippee it is finally Spring time where I live!! With Spring in mind I created a fun card and tag set. I think it they have a fresh Spring look to them! I used the amazing Distressed Text Stamp in the background first. The focal point of each piece is the fun NEW CircleDoodle Frames and I tucked in some pieces from Flourish Set 10. To finish them off I added a piece from the Small Sentiments Word Set. I hope you join along with this months challenge and can not wait to see what you all create. Hi fellow scrappers… I have been looking forward to spring all winter, as I’m sure most of us are.. 🙂 I decided to play with some of the bunny shaped chippies and created a cute Easter/Spring themed layout.. I have big plans for this layout, I will be adding photos to this as spring progress’s and I get some good photos of my daughter, who is expecting her first baby.. So wanting some big tummy photos for this layout 🙂 I used lots of fun chippies on my layout, the bunnies I covered with snowflake paste to give them that fluffy look, The grass I painted with two tones of green, light and dark.. I cut my flourish into two pieces and painted those with a light blue and green paints, I did the same for the butterfly.. for the title (Dream word set)and the background (mini circle Panel), I left those raw chipboard, since I really liked the contrast of color to the painted chippies. I was inspired by the grass and bright colours of this month’s challenge photo to create this fun series of Easter ATCs using the CE Bitten Bunnies. I used the CE Fairy Dust 2 Stencil with some Prima Art Basics Modeling Paste to add some texture to the background of the ATCs. I painted the Bitten Bunnies with Art Anthology Dimensional Paint in Chocolate Sorbet and used a dab of heavy white gesso for the eyes. I used SnowTex to create the puffy tail on the larger bunny. I also used the CE chipboard Grass Set, which I primed with white gesso and then misted with two colour of green mist; then I added glossy accents to the grass. Finally, I used two of the CE chipboard Flourish Eggs, which I painted with Prima Art Alchemy Metallique Acrylic Paints in Pink Blush and Rich Turquoise. I added some Stickles in Fruit Punch and Mermaid to the eggs to bring out the details. Happy Spring! Hi, everyone! For this challenge, I was inspired by the green color of this inspiration picture and the butterfly and for the twist, I used Rose set 2 that I embossed. I applied the acrylic paint with a Raindrop stencil to add texture on my background. I have fun to colorize the Bamboo with the acrylic paint. To add contrast, I stamped with the black Archival ink on my background with Distressed text stamp and Grunge stars stamp. To work my background, I stamped in tone on tone with acrylic pain and Distressed Chevron stamp. Happy Spring ! Happy Spring!! I was inspired by the paint splats in the challenge picture. I love my dog Kosmo. It’s no big secret …he totally tickles me and stole my heart instantly. Kosmo truly does the darnedest things. 🙂 I wuff him. The picture of him above is of him playing Frisbee. He literally lives to play. I could totally talk all day about this dog. I really wish they lived longer. I first applied heavy gesso to the background paper using the crackled brick stencil. I also added paint splats with our new paint splat stencil. I altered the infinite circle frame, custom KOSMO chippie piece, grunge heart corner and Fun heart set using my favorite TH paints and stains! For an added touch I added a few happy tails flair. Creative Embellishments and Petaloo are teaming up and doing a blog hop!! Please stop by both blogs daily April 3rd – April 9th for some awesome inspiration and a chance to win a prize from each store. Creative Embellishments is offering up a $30.00 gift voucher to the store for participants. We have a spring sale going on this month! 20% off store wide! Enter our challenge for a chance to win a $50.00 gift voucher to the store. Wow! Such beautiful and amazing creations here! So glad to join the first time here! Great ideas from some talented ladies. I love getting ideas from new blogs. This is my first time here and I'm really enjoying seeing these projects. Gorgeous and inspiring projects!! Stunning! So colorful, live this inspirations, I got to get working ;-) Tfs amazing Dt. Another month and a great challenge! Looking forward to create :)! Looking forward to the winner announcement for March as well :)!